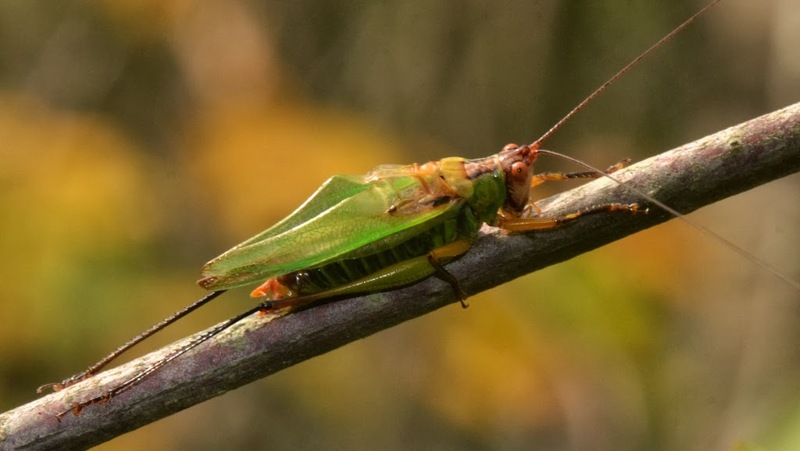 On a recent Sunday stroll in western Pennsylvania, we heard the 'tic-tic-tic-buzzzzzzzzz' of some meadow katydids calling in broad daylight from the tall grasses along the edge of a wetland area. 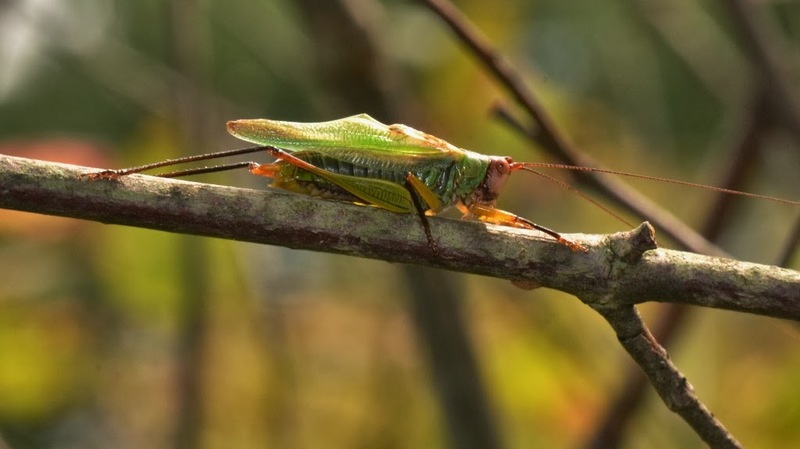 Their calling-song caught our attention since we don't seem to have this particular meadow katydid in our home area. We searched awhile to locate these singing katydids. When we did, we found this green, grasshopper-like insect with bumpy wings and a peach-colored head - the Black-legged Meadow Katydid (Orchelimum nigripes). We soon discovered the reason these katydids were hard to find... they managed to hide by deftly spinning around to the backside of their perches as we approached. My sharp-eyed son eventually spotted one in a bush.... and by fooling the katydid into thinking another intruder was approaching from a different direction, it rotated around into position for me to take photos. I even took a video of this intriguing insect. Here is a video of a Black-legged Meadow Katydid (Orchelimum nigripes) as it sings from a bush near the margins of a wetland. This is the calling-song I described as 'tic-tic-tic-buzzzzzzzzz'. Notice how the left tegmen (fore-wing) overlaps the right one in front of those unusual peaks in the middle of the fore-wings. The calling-song is produced from vibrations of the fore-wings when the row of teeth on the one tegmen is swept across a 'scraper' on the other tegmen. ... Why are they designed with that unusual shape? 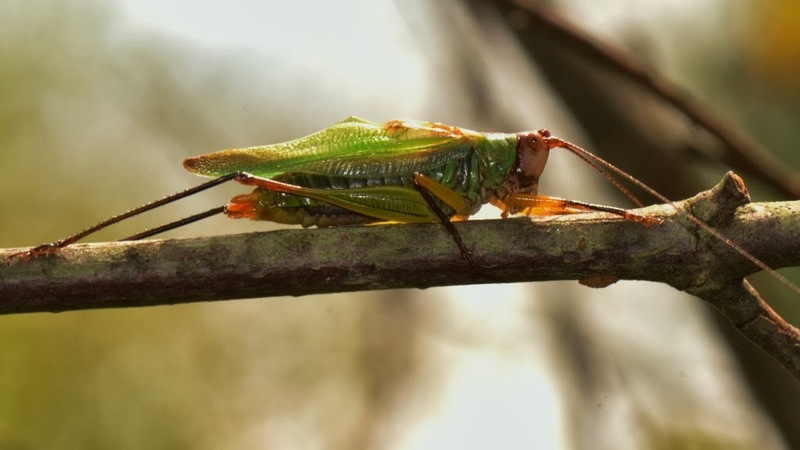 Are those 'peaks' specialized structures that are part of the katydid's sound-producing mechanism? Do those 'humps' function as part of a resonance chamber? Etc. Those are curious-looking wings, eh? At least they sure have made me curious. I reckon I will go searching for other members of the the meadow katydids (Orchelimum) which might be singing near the 'swamp' just up the road from home. I wouldn't mind taking a closer look at those fore-wings. All that, and more... from hearing a 'tic-tic-tic-buzzzzzzzz' emanating from the tall grass beside a swamp. Dana, I wonder if I've seen Katydids and thought they were grasshoppers. I love the marvellous videos you are taking with your new camera.